We had a Solemn Entry so each pilgrim could enter the empty Tomb of Christ. 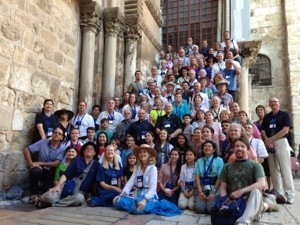 Before our entry we took this picture on the Crusader’s Steps up to Calvary. video tomorrow, so stay tuned. into the Tomb of Christ. Many people were in tears. of Christ and spend the rest of the day in Bethlehem.